controlled substance, as well as resisting arrest. 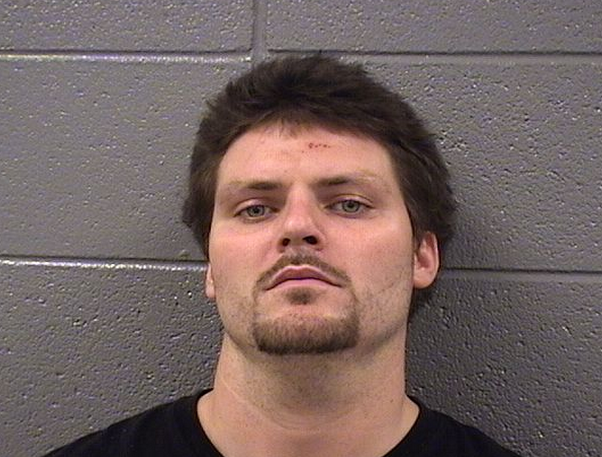 Michael Balice is currently held on $75,000 bail by the Cook County Department of Corrections and is next set to face a judge on Thursday, July 10 at Cook County Circuit Court Branch 48-4, 155 West 51st Street. Police said that Balice was involved in a traffic crash near 63rd and Narragansett at about 1:30 p.m. Monday, June 16. They added that a car that Balice crashed into belonged to an off-duty police officer. The off-duty officer said when he identified himself to Balice, that Balice ran away on foot, but was caught and subdued. Police said that Balice had 18 blue pills clutched in his right hand, which were believed to be alprazolam, as well as 24 clear plastic bags with a substance believed to be heroin. Aftermath of the crash, as posted publicly in a Facebook group. A local businessman who said he witnessed the incident posted publicly on Facebook that Balice's vehicle "...crashed into a Corvette, which then hit another car with little kids in it. [Balice's] SUV finally stopped [on 63rd Street] across from the [La Tia] restaurant and an off-duty cop ran up and confronted the driver. He had him on the sidewalk by the Fair Share [supermarket] fence, and the guy's girlfriend was standing by the passenger side door. The dude took off, running [south] across 63rd Street, through the [La Tia} restaurant gangway with the cop in pursuit. The cop tackled him in the back, and a struggle ensued. The dude had an easy hundred pounds on the cop and was fighting hard to get away. [My wife] started yelling at the guy to stop resisting or she would mace him. He hesitated long enough for the cop to get a better grip on him. Then another neighbor came running in from the alley and held the guy down until the blue and white showed up. When they picked him up there were needles and pills on the ground where he was laying." At that point, on-duty police arrived and arrested the pair, They are set to appear in Cook County Circuit Court Branch 34-4, 155 W. 51st St., on July 14. CPD did not released mugshots of Kelly and Mosley, because the Cook County State's Attorney's Office decided not to press felony charges, opting instead for a misdemeanor, according to police. Want to work directly with Chicago Police to prevent crime in your neighborhood? If you live in Beat 815 or 821 (see map), come to St. Bruno School (south entrance) at 7:00 p.m. Wednesday, July 2. Hear updates on crime in your neighborhood and learn how you can work with neighbors and police to make the community safer and better for all. A 19-year-old employee of the Subway sandwich shop at 6457 W. 63rd St. told police that the business was robbed of about $500 cash at 11:49 p.m. Sunday, June 22. The clerk said that a man who appeared to have a handgun walked in and committed the crime. After grabbing the cash from a register, the criminal ran away south on Natchez. A 19-year-old woman was entering the shop just as the hoodlum was running out. The robber's face was covered with a white bandanna. He is described as a white man age 20-25, 5'6 and 120 pounds, light complexion, wearing a black Adidas baseball cap, a black t-shirt and black pants. Two men were arrested and charged in connection with the burglary of a garage near 50th and La Crosse at 7:45 p.m. Tuesday, June 17. Jamie Banuelos, 47, of 51st and Keating, and Marcus A. Serrano, 30, of 46th and Christiana, were arrested as they rode bicycles down an alley behind 5112 S. Lamon. Police were responding to a “burglary in progress” call and said that Serrano was riding a stolen bike and Banuelos had a stolen power saw and tape measure in the basket of his bike. Police said they were alerted to the crime by a neighbor who witnessed the burglary and called 911. Police said Serrano’s shirt was smudged with dirt and spider webs, which they said was consistent with the condition of the inside of the garage. 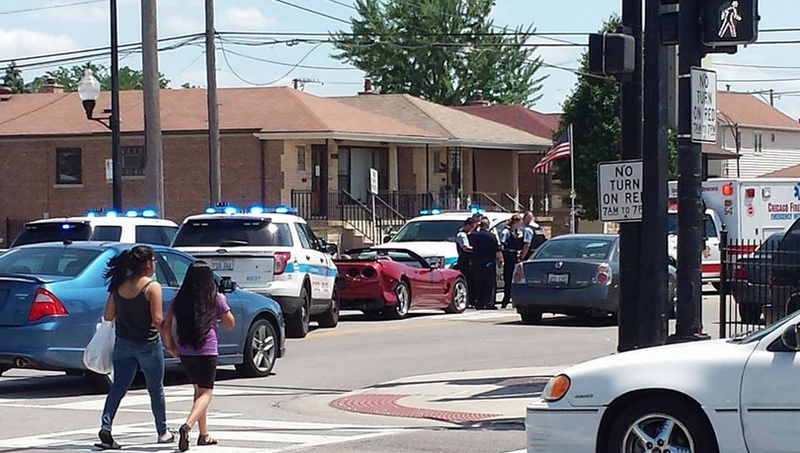 The CPD incident report did not give information on a court date. A 63-year-old Garfield Ridge woman told police she was accosted by a man who tried to rob her as she walked down a sidewalk near 56th and Nottingham at 1:50 a.m. Tuesday, June 17. She had just gotten off the Archer bus and was walking south on Nottingham when the attacker pushed her to the ground and yanked at her purse. The woman fought back and succeeded in hanging onto her purse. The would-be robber gave up and ran away empty handed. He is described as a white Hispanic man about 23 years old. The victim, scraped up and short of breath, was transported by CFD ambulance to MacNeal Hospital. A 58-year-old woman told police that she was robbed of a gold chain at she walked down a sidewalk near 50th and Kildare at 11:20 a.m. Friday, June 20. She said the attacked lunged at her and grabbed the chain around her neck, saying, “Give me your f~cking chain.” He then ran south on Kildare. The robber is described as a white Hispanic man age 20-30, 5’5 to 5’7 and 150-200 pounds, brown eyes, medium-length brown hair, olive complexion. Burglars forced open the service door of a garage near 58th and Central and stole a green 2001 Isuzu Rodeo. The crime was discovered by the victim, a 29-year-old woman, at 7 a.m. Wednesday, June 18. Burglars used a bolt cutter to break into the service door of a garage near 62nd and Mayfield and steal a large toolbox filled with tools. The crime was discovered by the victim, a 59-year-old man, at 11 p.m. Friday, June 13. Burglars forced open the side door of a home near 64th and Latrobe and stole assorted power tools. The crime was discovered by the victim, a 29-year-old man, at 3 p.m. Friday, June 13. The victim gave police the name of a man he believed was involved in the burglary. Police were investigating.